Robert “Pat” Mailhouse is a New Haven native and graduated from Hillhouse High School. Pat entered Colorado College, but his college career was interrupted by World War II. Pat served in the 9th Army Air Corps, 409th Bomb Group operating in England and France. He completed his degree at Colorado College after which he taught high school in Colorado. 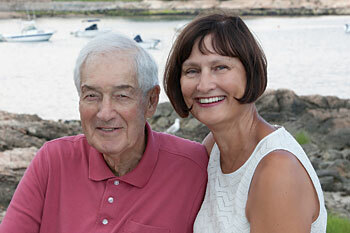 Pat worked in California for a short time and then moved to Branford in the early 1950s. Pat was newly married and with his wife raised his three children in Branford. Pat’s business career was with the family-owned Plymouth Electric Company headquartered in North Haven, Connecticut. The company was the distributor in Connecticut and Western Massachusetts for Zenith Radio and Television, Kitchen Aid and Amana products. Pat’s past community involvement included many years in the Rotary Club, the Branford Economic Development Commission, and sponsoring New Haven’s American Legion baseball teams for over 40 years. For several years, Pat and his wife Joyce, have thought about starting a fund with the Branford Community Foundation, inspired by others who have been so generous. They wanted to enhance a community which they both love and enjoy. In 2011, the Pat and Joyce Mailhouse Fund was established. Through this fund, Pat and Joyce hope to promote athletics and the arts in the Branford community, two areas that are so crucial but often overlooked with the crush of requests for funding life-threatening issues. Their inspiration is found within their own family and in the many great sports teams in Branford and the interest their children and grandchildren have in fine arts, music, and drama. The Branford Community Foundation is indebted to Joyce and Pat Mailhouse for their generous donation in establishing a fund which will improve the Branford community for years to come.